7 August 1914: Entered the Army as a Fahnenjunker in the Badisches Fußartillerie-Regiment Nr.14. 20 April 1916: Transferred to the Replacement Battalion of Foot Artillery Regiment 14. 1 May 1917: Returned to Foot Artillery Regiment 14 in the field. 25 September 1917: Transferred to Foot Artillery Regiment 212. 21 March 1919: Transferred to Reichswehr Artillery Regiment 13. 1 October 1920: Transferred to Schützen [Rifle]-Regiment 25. 1 January 1921: Transferred to the 13th (Württemberg) Infantry Regiment. 1 October 1921: Transferred to the 5th Artillery Regiment. 1 October 1924: Transferred to the 2nd (Prussian) Artillery Regiment. 1 February 1929: Battery Chief in the 7th (Bavarian) Artillery Regiment. 1 January 1935: Instructor in Training Staff A at the Artillery School at Jüterbog. 1 October 1937: Commander of the III. Battalion of Artillery Regiment 26 of the 26th Infantry Division. 15 July 1943: Delegated with the leadership of the 21st Panzer Division in France. January 1945: Sentenced to death and reduced in grade to the rank of Kanonier, a private in the artillery. 2 March 1945: Pardoned and transferred to the 20th Panzer Grenadier Division as a Kanonier; however, Feuchtinger disobeyed the order and fled to Celle. 29 May 1945-1947: Prisoner of war in British captivity. 17 December 1946: Transferred to the London District Cage (LDC) from Island Farm Special Camp 11 for onward routing to the U.S. Historical Section Allendorf on loan (W.O. Auth. UM/M/3616/PW1). 7 August 1947: Transferred to Island Farm Special Camp 11 from the LDC. 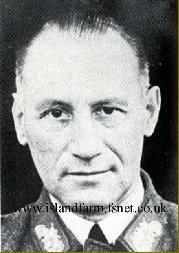 23 August 1947: Transferred to Wuppertal Jail from Island Farm Special Camp 11. General Edgar Feuchtinger, an artilleryman, had no combat experience [in World War II], and none at all of panzer units. He had become known in Germany as the organizer of the military part of the so-called Reichsparteitage, the national Party rallies, and through that was very familiar with Hitler and the Party apparatus. Feuchtinger was a live and let live person. He was fond of all the good things of life, for which Paris was a natural attraction. Knowing that he had no combat experience or knowledge of tank warfare, Feuchtinger had to delegate most things, that is, leave the execution of orders to us experienced commanders. Although I too hold to the saying de mortuis nil nisi bene (“of the dead say nothing but good”), when I think of our brave men, who fought so brilliantly, and of the thousands of dead, wounded, and missing…I cannot help reproaching Feuchtinger with having done us all poor service. Knight’s Cross of the Iron Cross: 6 August 1944, Generalmajor, Commander of the 21st Panzer Division. German Cross in Silver: 15 July 1943, Oberst, Commander of (Armored) Artillery Brigade West (931). Bradley, Dermot; Hildebrand, Karl-Friedrich; Rövekamp, Markus. Die Generale des Heeres, 1921-1945, Band 3 (Dahlmann-Fitzlaff). Biblio Verlag, Osnabrück, Germany, 1994. Luck, Hans von. Panzer Commander. Dell Publishing, New York, New York, 1989. Pallud, Jean Paul. “The French Navy at Toulon,” After the Battle, Number 76 (1992), pp. 1-29. Prisoner of War File Card for Generalleutnant Edgar Feuchtinger prepared by Captain Edward “Ted” Lees, camp intelligence officer and interrogator, Island Farm Special Camp 11.